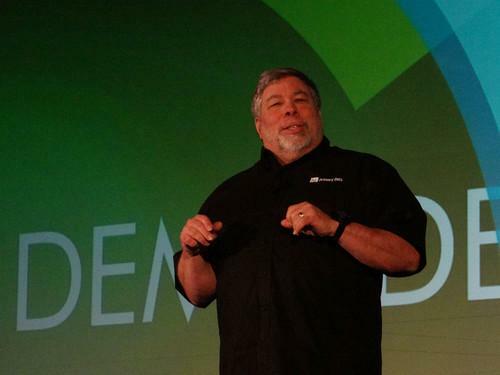 Apple co-founder Steve Wozniak spoke on Wednesday at Demo in San Jose. For the Woz, it's all about the engineering. The Apple co-founder is now working with an enterprise storage startup that launched on Wednesday, but for Wozniak the engineering itself matters more than whether he's working on business or consumer products. "Applying your art is the more important thing to me," Wozniak said as he announced his role as Primary Data's chief scientist at the Demo conference in San Jose. "Coming up with clever ideas, putting them into products, making something good." The talkative Wozniak made comments on a few other topics in a brief on-stage interview after Primary Data gave its opening pitch. On how personal computers live on in data-center technology: "They're still here, they're just unseen." On the role of engineers in startups: "A lot of people have ideas. ... only the companies that realize it and turn it into something real ... those are the ones that really deserve the credit and the money." "That doesn't mean that engineers should have the ideas all the time. They kind of have to work together. They're a huge part of the formula. Engineers are taught to solve problems, to make things without any errors, so that they will work." "Apple came from an engineering start, and then we moved into marketing-driven for the next 10 years. We had failure after failure, and they were all because of marketing failures." On Google Glass: "I actually kind of like Google Glass ... just for its coolness factor." "I've tried a few and so far haven't been turned on. ... It's too small a screen, and you've still got the phone in your pocket. You can hold your phone up or you can hold the watch up ... but the phone has a much better user display. I'm a little turned off by the small displays so far." "I'll try it ... I think a luxury fitness band would be great for the iWatch."